for Trumpet, 2 Violins, Viola & B.C. for Oboe d'amore, Strings & B.C. for Trumpet, Violins, Flute, Oboe, Strings & B.C. 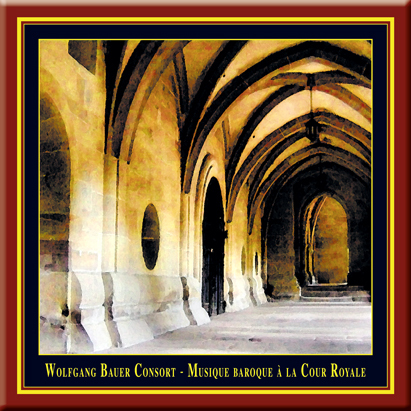 "Moments of a royal theme"
The celebrated Wolfgang Bauer Consort performs elegant baroque music à la Cour Royale by, among others, Johann Sebastaian Bach, in this triumphant concert recording made at the convent church in Maulbronn. The distinguished soloists are Wolfgang Bauer (trumpet), Ingo Goritzki (oboe), Sebastian Hamann (violin) and Heidrun Laukemann (flute).